Paget’s disease is a chronic bone disorder that causes affected bones to become large and misshapen. Men are more commonly affected by Paget’s disease than women (ratio of 3:2) and people are not usually diagnosed before the age of 40. The process of bone remodeling is disrupted so that excessive bone resorption is followed by chaotic bone growth. Patients require vitamin D and calcium supplementation, along with moderate exercise (in the sun) to maintain joint mobility, but there is no cure. Paget’s disease: Paget’s disease of bone is a chronic disorder that can result in enlarged and misshapen bones. Along with osteomalacia, rickets, and osteoporosis, Paget’s disease is associated with vitamin D deprivation. If one chooses to avoid exposing unprotected skin to the UVB radiation of the sun, then one must compensate for this lack by taking vitamin D supplements or risk the development of one of these diseases. Paget’s disease of bone is a chronic disorder that can result in enlarged and misshapen bones. The excessive breakdown and formation of bone tissue causes affected bone to weaken, resulting in pain, misshapen bones, fractures, and arthritis in the joints near the affected bones. Paget’s disease typically is localized, affecting just one or a few bones, as opposed to osteoporosis, for example, which affects all the bones in the body. Although there is no cure for Paget’s disease, medications (bisphosphonates and calcitonin) can help control the disorder and lessen pain and other symptoms. Paget’s disease of the bone: Paget’s disease of bone is shown in the left pelvis. 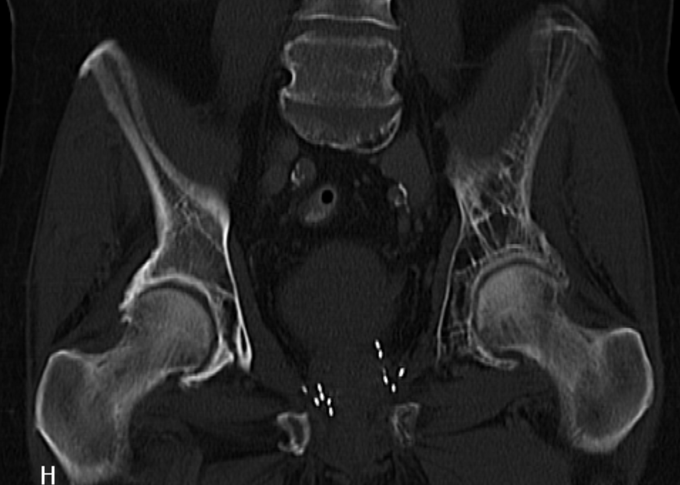 Notice the seeds in the prostate after brachytherapy. Paget’s disease is rarely diagnosed in people less than 40 years of age. Men are more commonly affected than women (ratio of 3:2). Prevalence of Paget’s disease ranges from 1.5 to 8.0 percent, depending on age and country of residence. Because early diagnosis and treatment is important, after age 40, siblings and children of someone with Paget’s disease may wish to have an alkaline phosphatase blood test every two or three years. If the alkaline phosphatase level is above normal, other tests such as a bone-specific alkaline phosphatase test, bone scan, or X-ray can be performed. Initially, in Paget’s disease there is a marked increase in the rate of bone resorption at localized areas caused by large and numerous osteoclasts. These localized areas of osteolysis are seen radiologically as an advancing lytic wedge in long bones or osteoporosis circumscripta in the skull. The osteolysis is followed by a compensatory increase in bone formation induced by osteoblasts recruited to the area. This is associated with accelerated deposition of lamellar bone in a disorganized fashion. This intense cellular activity produces a chaotic picture of trabecular bone (“mosaic” pattern), rather than the normal linear lamellar pattern. The resorbed bone is replaced and the marrow spaces are filled by an excess of fibrous connective tissue with a marked increase in blood vessels, causing the bone to become hypervascular. The bone hypercellularity may then diminish, leaving a dense “pagetic bone,” also known as burned-out Paget’s disease. 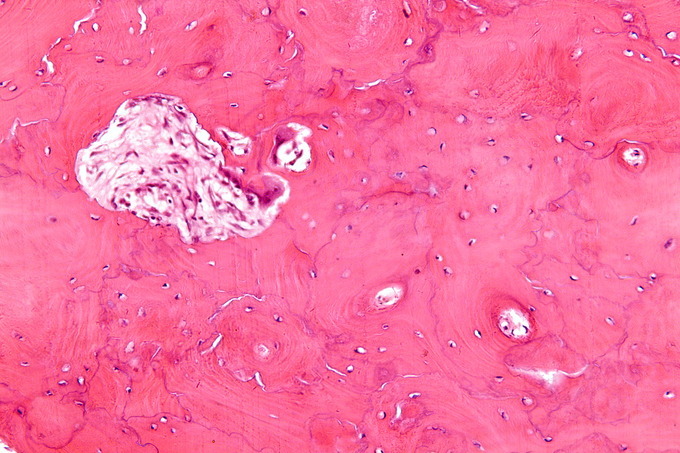 Paget’s disease bone tissue: High magnification micrograph of Paget’s disease of the bone. Notice the prominent jigsaw-puzzle like pattern. In general, patients with Paget’s disease should receive 1000–1500 mg of calcium, adequate sunshine, and at least 400 units of vitamin D daily. Exercise is very important in maintaining skeletal health, avoiding weight gain, and maintaining joint mobility. Since undue stress on affected bones should be avoided, patients should discuss any exercise program with their physicians before beginning.